Million Looks is a fun blog read that covers fashion news and cutting edge fashion trends, famous designers and designer brands, as well as fashion shows and fashion week. If you are interested in fashion trends for clothes, footwear, accessories, style secrets, the catwalk, models celebrities and designer brands this site is fun to look at. Million Looks is not alarmist or too gossipy. It’s actually a pretty clean cut site that simply covers fashion. From best dressed, to haute couture collections to Spring and Summer trends, women will like to browse this web site. There are plenty of famous people and good fashion pictures to check out. Overall, MillionLooks is good read. 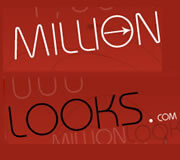 To visit click their MillionLooks logo above and millionlooks.com will come up. Have fun!